Bing’s strategy over the years has been to pretty much copy Google Ads features, so it’s always a surprise when they launch something unique to their platform. A couple of weeks ago, Action Extensions were released as a way to show a button with your text ads and encourage users to book, apply, contact, and more. Action Extensions could be valuable to create a sense of urgency and let your customers know what to do once they click on your ads. To set them up, go to your Campaigns tab. Decide if you’d like to add action extensions at the account, campaign, or ad group level. For most businesses, account level will make most sense. For example, retail advertisers will want to encourage users to buy across all campaigns. B2B on the other hand, may want to push a contact or register call-to-actions, depending on your offer and lead process. Once you’ve decided the level at which you’ll add your action extensions, go to Ad Extensions and select Action Extensions from the drop down. Click the Create ad extension button and +Add new Action Extension. Select your language and choose from one of the many action text options most applicable to your business and goals. The URL fields are optional and can be left blank, unless you’d like to take the user to a specific page that’s different from your ad URL, such as your contact page. Ad scheduling is available but is not required. I can only think of it being applicable for action extensions that push messaging, where you want to ensure that this ad extension does not show outside of your business hours. You can set-up and test multiple action extensions at once if several of the pre-set action text options are applicable. As with any ad extension, these won’t show every time a user searches as Bing chooses what ad extension is most relevant to each query, taking into account location, device, and other signals. In the accounts I manage, the new Action Extensions are showing in about 20%-40% of all served ad impressions. This entry was posted in Ad Text Optimization, Bing Ads on April 19, 2019 by kristina. If you use Bing Ads, you may have noticed a new feature – Call Extensions- which Google AdWords has supported for quite some time now. This is an important feature for any business that relies on phone calls for sales and leads. 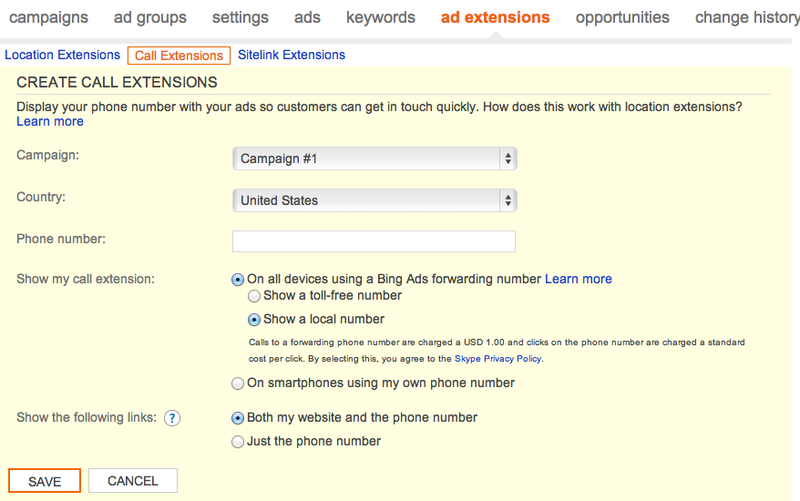 Bing’s new call extensions are very similar to Google’s, allowing advertisers to associate a phone number with their ads. To set them up, go to your Campaigns tab in Bing Ads and click on ad extensions. Click on the Call Extensions link and follow the prompts to add your phone number. You’ll be able to select a specific campaign to associate a phone number with, as well if you’d like to show your phone number on all devices or on smartphones only. You can choose to show both your website and the phone number or only show the phone number on mobile devices. I prefer giving people the option to decide if they should call you versus click on your website. If you choose to use Bing’s forwarding number, you’ll be charged $1 for calls to this forwarding number. This entry was posted in Ad Text Optimization, Bing Ads and tagged bing ads call extensions, call extensions on October 1, 2013 by kristina. adCenter recently launched ad extensions to enable advertisers to show their business contact info with the ad. It’s an easy and quick way to ensure your ads stand out. To enable it, go to your campaign settings, and under the advanced settings section, you should see an Ad Extensions option. Make sure that you select to display your address and phone number, and you are all set. Before you’ll be able to take advantage of this option, you’ll need to add a business location by clicking Manage your business locations on the Campaigns tab. This entry was posted in Bing Ads and tagged ad extensions, adCenter Ad Extensions, bing ad extensions, yahoo ad extensions on April 17, 2012 by kristina. Microsoft adCenter just lauched advanced negative match, a feature AdWords has had for a long time now, to help advertisers better prequalify traffic. Now you can set Phrase and Exact Match negative keywords in your adCenter campaigns for even greater precision in filtering unwanted search traffic. Previously, adCenter only allowed Negative Broad. For more information about negative keywords as well as how to use them, please see this post on negative keyword best practices. Another new feature you may want to check out is their insights into keyword conflicts. Use the new Negative Keyword Conflicts report to learn if you have set any negative keywords that are same as your actual keywords. The report can help resolve any conflicts and help improve performance. It can also helo explain why some of your perfectly relevant keywords have not been getting any impressions. This entry was posted in Bing Ads, Keyword Optimization, ROI and tagged bing ads negative keywords, bing negative keywords, bing negatives, negative keyword conflicts on November 18, 2011 by kristina. adCenter recently increased their negative keyword limits to ‘thousands.’ This is great news for those who have been optimizing their campaigns in preparation for the Yahoo search marketing and adCenter merger. Previously, advertisers were able to only add less than a 150 negative keywords. To start taking advantage of the new system capability, go to your campaign or ad group settings and add new exclusions. Unfortunately, unlike with AdWords, in adCenter negative keywords still cannot be assigned a match type. If you’re curious about when you might want to assign different match types to your negatives, and want to read more about negative keywords, see my post on negative keyword best practices. This entry was posted in Bing Ads, Google AdWords, Keyword Optimization and tagged adcenter negative keyword limits, adcenter negative keywords, bing negative keywords, microsoft negative keyword limits, microsoft negative keywords on October 26, 2010 by kristina. Yahoo & Microsoft announce new editorial guidelines for paid search. Yahoo and Microsoft announced their new paid search editorial guidelines that will begin in early August. The new guidelines are part of the alliance between Yahoo and MS (see previous blog post). Make sure you review the new content restrictions and policies and see if you’re impacted. If content policies do not apply to you, still read through the ad content and style policies to ensure you’re ready for the transition. This entry was posted in Bing Ads, PPC, Yahoo Search Marketing and tagged Bing Ads, bing paid search, microsoft adcenter, ppc, ppc expert, ppc marketing, yahoo bing alliance, yahoo microsfot alliance, yahoo microsoft merger, yahoo saerch marketing on July 15, 2010 by kristina. Microsoft and Yahoo announced earlier this year that they’re forming an alliance by uniting their search advertising platforms. The alliance will make both companies more competitive with the current leader in online advertising, Google AdWords. Advertisers will reportedly benefit from greater reach, better technology, more resources freed up for innovation, and improved customer support. What does this mean for current advertisers? Microsoft adCenter will be the platform for search campaigns for both companies and those using Yahoo will need to transition their ad campaigns over to adCenter. The transition is planned to take place before the 2010 holiday season, but it may be delayed until 2011. Advertisers should prepare by learning more about the upcoming changes. You may need to shorten your ads, expand keywords, and check your bids. Start making changes now, so you experience a smooth transition! I, for one, am very excited about using only one platform and am looking forward to a more unified experience. More importantly, I am hopefully that this alliance will make Yahoo and Microsoft better source of qualified traffic, as both have been struggling to keep up with Google. The reality is that most of my clients get the bulk of their traffic and leads from Google, plus the AdWords platform provides far more advanced options and features. Getting some real competition in the PPC world can only mean good things for advertisers and agencies. This entry was posted in Bing Ads, PPC, Yahoo Search Marketing and tagged Bing Ads, microsoft ads, ppc, yahoo search marketing on July 11, 2010 by kristina.